If you live in a part of the country where you don’t have this little critter, be grateful. Here in Connecticut, so far, at least in my yard, it has not proven to be an “agricultural problem,” shall we say. In other words, I am not finding them on my trees, shrubs, flowers or vegetables. I employed a completely different remedy for removal. I know, from most of my dealings with insects in the house in the winter (not to mention the fact that my house is kept quite chilly) that these darn things are slow and dumb–or at least slower and dumber than I am. 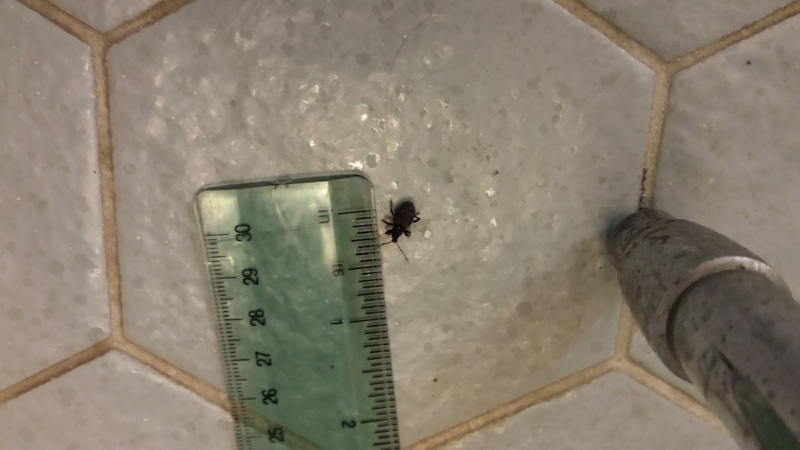 So I knocked it from over the shower head to the floor of the shower (for those of you who didn’t take the digression, you can’t just squash one of these things. They do stink to high heaven). Then I just simply picked it up in a tissue and flushed it in a low flow toilet. Not the most environmentally friendly solution, but most people say to vacuum them up and then dispose of the vacuum bag and that, to me, is a less-environmentally friendly solution–all for one bug? So to each his or her own solution–just don’t crush the bug in your house! The “bugs” appear a few days after I got it. There aren’t many–one or two at a time. But they’re large–3/8″ to 1/2″ as you can see by the ruler next to this one. And they are clearly some sort of weevil, which is not quite so obvious from this photo. So here’s where the fun comes in. I look this thing up in all the usual places. I start on the computer with search terms like “invasive weevil” or weevil in house. I get the usual suspects that might be in my area: strawberry weevil, rhododendron weevil, things like that. So I break out the bible of all bug books, Whitney Cranshaw’s Garden Insects of North America. If it’s not in there, it’s not to be found. I do find something similar–the Pale’s weevil–but of course, that’s only found in the Midwest and I am in New England. A full 2 years later, at one of those 1 day Bio-blitz things where they try to ID all the species in a given locale, I read that they have found the “first ever” Assassin Bug in Connecticut. And I think, “Oh no, you haven’t” but of course, what can you say about that? So if I have some new invasive weevil, what should I be doing? Stomping on them, I suppose. I’ve already thrown 2 out the window, thereby forever altering Connecticut’s delicate ecosystem. This is how invasions start. Let’s hope it was too cold for them to survive–or that my trusty birds ate them for me! Later searching led me to this fact sheet that reassured me that these things were in fact native to my region so I hadn’t brought on a bug-pocolypse after all. They’re native to the “eastern” United States from Texas to Nova Scotia. That’s some definition of “east!” Anyway, I feel relieved that I haven’t started a new invasion. I just hope I haven’t now imperiled my trees! 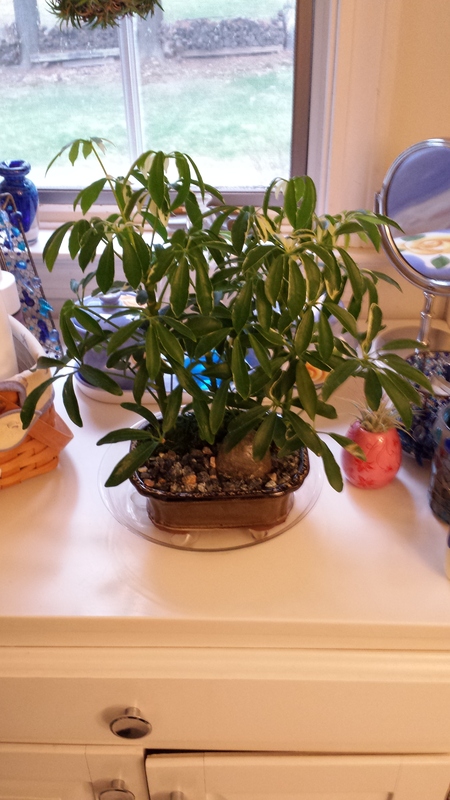 This little plant was rescued from one of my larger crotons when I was repotting it. Now that it’s free, it’s quite happy–so happy that it’s flowering. 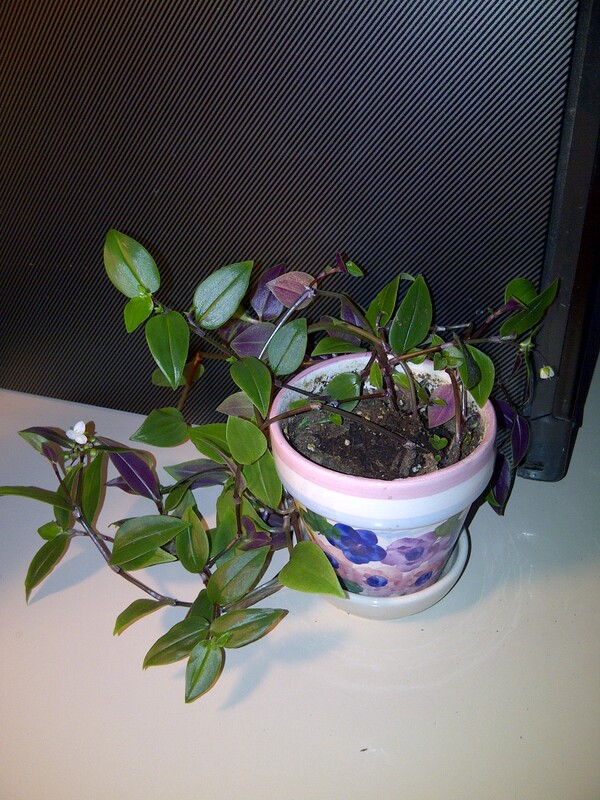 A little more research showed that it’s tradescantia flumenensis. Apparently, down south, this plant is considered an invasive species. Perhaps that’s how it found a ride in my croton. I’ll need to be careful about where I keep it and whether I put it outdoors for the summer–because while it shouldn’t survive my winter temperatures, if we get one of our crazy winters, you just don’t know. An article in the Hartford Courant a week or so ago talked about how one of our riverfront towns, Glastonbury, was going to be attempting to control oriental bittersweet (celastrus orientalus) in its riverfront park. It was soliciting volunteers (the deadline to sign up is today, so if you live in Connecticut anywhere near that town and would like to volunteer, please see the article for how to do so!) for the clean-up, explaining that what many see as verdant green growth was actually an invasive monster that is taking over trees, killing them, and then going on to spread seeds to continue the cycle. Back in 2011, when the October snowstorm brought down so many trees, one of the factors that was cited was this same bittersweet. It was noted that it was climbing many of the trees that had come down, and that the weight of the leaves and its trunks (because the vine can actually form thick, ropy trunks, like poison ivy, only without the hairy coating) significantly contributed to the way the trees caught the snow and therefore toppled over. Connecticut is not the only state with this problem–the vine has been called the “Kudzu of the North” for its prominence and its invasiveness. I’ve seen it in New York and New Jersey, and all throughout New England, as far north as Maine. Needless to say, it is also in the South, but I think kudzu outcompetes it. Even if you are nowhere near Glastonbury, CT, or have no interest in assisting it in its mission to control bittersweet, if you live in a climate where this vine is a problem, be alert for it on your own property. Young seedlings are easily hand-pulled. Once it gets hold, it’s almost impossible to pull out, and cutting it only causes it to branch and become more vigorous. My suspicion is that Glastonbury is going to try cutting it and painting the ends of the cut stems with glysophate–or perhaps even something stronger. This is the time of year when woody plants are conserving their energy and taking nourishment to their roots so it is the best time of year to try to control them. I wish them well–as someone who regularly battles this on my own property, I know what a struggle it can be! About a week ago, my Yahoo home page had an article from the online version of the Wall Street Journal that was sensationally titled something like “A Plant that Comes with Jail Time,” or some such thing. It may have gotten folks’ attention, and if it did, that’s a good thing because bamboo is really no laughing matter. I tweeted about it at the time, but the matter really needs more than 140 characters–and even then I put out 3 tweets. The article was primarily about running bamboo, a plant which has now been banned in my home state of Connecticut. That may sound extreme, but I remember back in my retail gardening days, we had a lovely stand of yellow bamboo on the property where I worked. Customers would ask about it and I was always very careful to note that the owner had sunk a concrete barrier 3′ into the ground to assure that the bamboo would remain contained. Folks were decidedly less in love with the plant after I mentioned that and I never did sell one plant. Around that same time, however, a so-called clumping bamboo, a fargesia, which had been planted on my property before I got there, began to “run,” or send out runners. Since this was not supposed to be technically possible, I was completely un-amused. I immediately dug the plant out, got as many of the roots and runners out as could, bagged it and disposed of it in the trash, not the compost pile (heaven forbid!). For 5 years, runners continued to come up in the yard and only vigilance kept them under control and finally completely eliminated them. Now I am surely not dealing with anything like walls of bamboo like the running kind produce, nor am I having to dig it out with a backhoe. But I wanted readers to know that even the so-called “clumping” types of bamboo don’t stay put and don’t play nicely with others. Interestingly enough, I replaced the bamboo with a native plant, northern sea oats. It’s a lovely grassy plant; however, its seed heads do self-sow rampantly around in my nearby gardens. And they are just about impossible to remove. I suppose I need to think of them as I do they asters that I so love–with deep tap roots to aerate my heavy clay. But should that plant ever die, the next thing that’s going there is a sculpture or a bench!